METHUEN, Mass. - E.J. Perry IV on a basketball court is like watching an oil painting in real time. Every shot with purpose. Every rebound with force. Every steal with skill. The star guard for Andover doesn’t have much time left in the blue and gold and made one of his final big games worth it. Perry filled the stat line with 29 points, eight rebounds, four steals, two assists, and a massie block to pilot the Golden Warriors past top-seeded Methuen 66-63 in a thrilling semifinal of the Commonwealth Motors Christmas Classic. Perry has just five more games in his basketball career before enrolling early to Boston College, where he will play quarterback. Close Perry did, with a hard rebound with seven seconds left and two free throws to give Andover the final edge. “That’s the best type of basketball ever, especially when you’re playing such a great team,” Perry said. Andover started the game like a house afire, running out to a 19-7 lead late in the first quarter after being down 4-0 in the opening minute. Perry scored Andover’s first six points. Brendan Witton chipped in with 14 points for the Warriors and Emmett Kim had eight points off the bench. Andover rotated early and often against the Rangers. 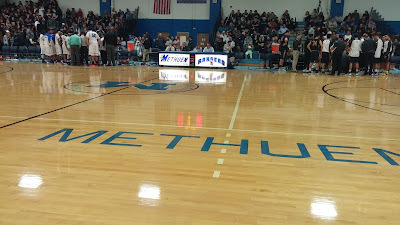 Methuen kept chipping away at the lead, got it down to seven by halftime, and took a 46-45 lead on a bucket by Kevin Fernandez late in the third. A pair of free throws by Fernandez put Methuen up 62-60 with 1:49 left. Fernandez led a dynamic backcourt with 22 points for Methuen. Dante Rivera ran point for the Rangers and put in six points but also grabbed eight rebounds and dished a game-high seven assists. 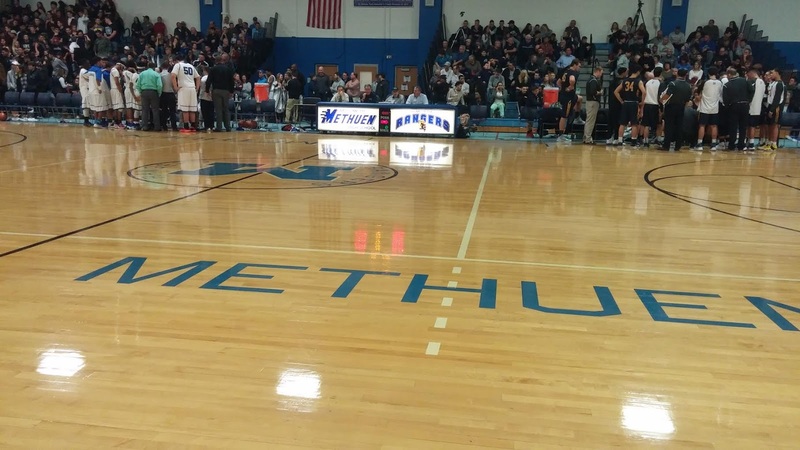 Uriel Cirineo had 13 points and five rebounds for Methuen, and Evan Hardy had 13 points, all in the second half. Andover will meet Central Catholic for the tournament title in a renewal of one of the state’s best rivalries. Central beat North Andover 65-55 in the other semifinal. The game will happen Thursday night at Methuen High at 8 p.m.